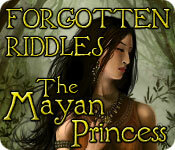 Forgotten Riddles - The Mayan Princess is rated 3.5 out of 5 by 15. Rated 5 out of 5 by arnold1049 from NICE SURPRISE This game was part of the bonus material at the end of Enlightenus II and what a surprise. I mean the entire game was provided; 19 levels that took me over 7.5 hours to play. This was my first experience with a riddle game and I really liked it. It did get repetitious at times; same locations and often the same riddles, but the storyline was something that made me want to see the next chapter. In this game, you are given a riddle that you have to solve in order to figure out what object you must find in the accompanying HOS. After solving x number of riddles and finding the matching objects, you then played a rotating tile puzzle to read the next chapter about the fate of the Mayan princess. I played the timed mode and I think I ran out of time about 3 times and had to start all over. The time limit includes both the HOS's and the puzzle at the end of each level. So if I was slow solving the riddles and finding the objects, then I didn't have time to solve the puzzle. Some of the puzzles were difficult also. You are only allowed 5 hints for each level. I do have to say that, even after figuring out what object I was looking for, they were sometimes very hard to find as the majority of the objects are extremely small. But, then, that was part of the challenge. After this, I'm sure I will be playing more riddle games. Rated 5 out of 5 by fredandethel from Unusual and absorbing OK I'm no expert, but it took me five and a half hours spread over two days to complete this, and I'll be happy to replay it quite soon. I've owned Forgotten Riddles Moonlight Sonata for nearly two years now but have only just discovered Mayan Princess. The graphics are not so clear and the scenes are more cluttered than in Moonlight Sonata, but the riddles are just as much fun and the scenes are varied and interesting. More like this, please! Rated 5 out of 5 by BellaMorte from Enjoyable Been a while since I played this game but what I remember the graphics are great (big fan of drawn graphics) and the level of challenge was good. Not a difficult game to play but enough of a challenge to keep going. Rated 4 out of 5 by pennmom36 from Forgotten Riddles: The Mayan Princess This game certainly should not be forgotten! It's a simple but highly entertaining game that makes you think about the Hidden Objects you are tasked with finding. Although the storyline is good, it does seem to wander off a bit when it comes to being realistic. You are the Chief Archaeologist who has been asked by the Embassy to find out the real story of the Mayan Royal Family. During a recent dig, ancient runes were discovered which puts holes in the theory that the royal family met it's demise in in 1536. Artifacts left by the princess however dated in 1556 would have been 20 years after the supposed Royal family tragedy. Your mission (should you decide to accept) is to decrypt the Runes and uncover the real truth. Here's where the storyline fails a bit...You choose a location to search for Hidden Objects, it would have been nice if the beautiful Mayan locations would have kept true to the Mayans and hadn't cluttered the scenes with modern day junkpiles, but that's not the real problem. There is no "list" or "silhouettes" to search for, no, it's way cooler than that. You need to choose one of seven runes, read a riddle describing the object you are searching for and find the item in the scene that matches the description.You can choose the runes in any order and you can skip any rune and go on to the next one, saving the stumper for last. Unless you choose the easier mode of difficulty (which gives you more time and more hints) you will need to find the items within 20 minutes, but the 20 minutes must last you for the entire level, not just that HOP. If you get stumped you can use a Gem for a hint which tells you what to look for in more depth but doesn't show you where to look. Here's what I had a problem with, an example riddle reads: At the first sign of moisture from the sky, simply open me up to assure you stay dry. Of course it's an umbrella and yes the riddles get more challenging, but if these runes were found in an archaeological dig and dated back to the 1500's I assure you they didn't have a pop up modern day umbrella back then! Between levels you get to play a Mini Game to unlock the next level, you rotate square tiles to create an image, but it's really easy because the rows lock down once all squares in a row are correctly rotated. Not a bad game, certainly one that can go unnoticed, enjoy!. Rated 4 out of 5 by cbilbo from Riddled with riddles I should had read the reviews and the description of this game closer. I had no clue that this was a game filled with riddles. In order to find the hidden object, you have to be able to solve the riddles. This wasn't one of my favorite games, but far from being the worst. The graphics are great. The riddles get harder as you go along. I fought a few with trying to solve the riddles then the puzzles in the alotted time frame. If you are into riddles, then this game is for you. I got agrivated and had to take several breaks with this game. It was just too many riddles all at once for me. Rated 4 out of 5 by Pucktweety from Very fun! 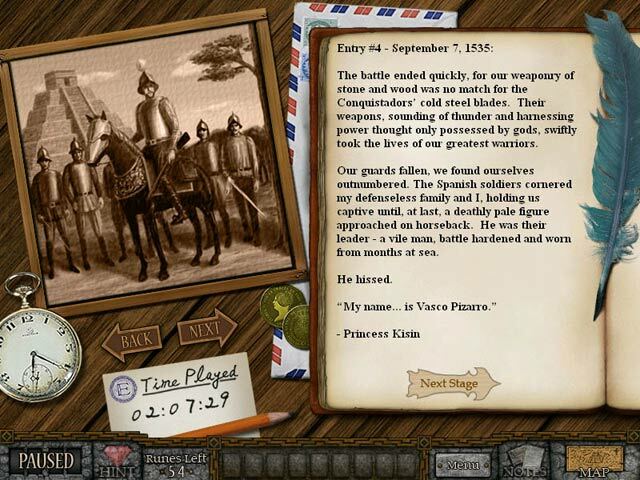 Much like the first game in the 'Forgotten Riddles' series this game includes a great storyline along with a very unique way of finding clues. Much like the first game also my major problem was that it was way too short and I had it finished within an hour or two of buying it. It was a little longer than the first but not enough to really get your moneys worth. 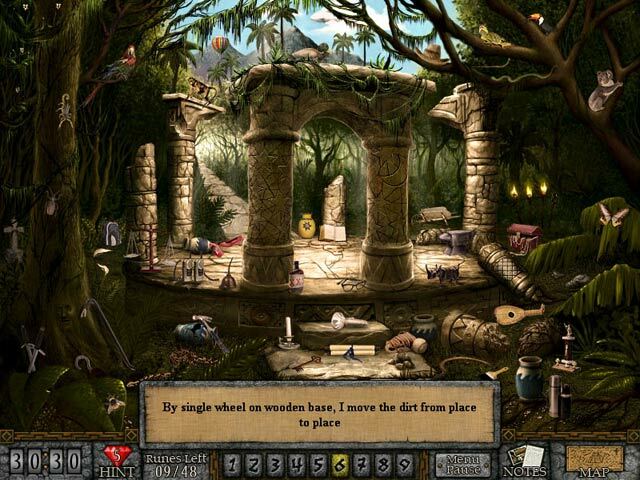 It also gets less interesting when you replay it as by that time all those hard riddles before come easily and there is no longer a challenge, as once you solve the riddle, finding the item is most often not difficult at all. 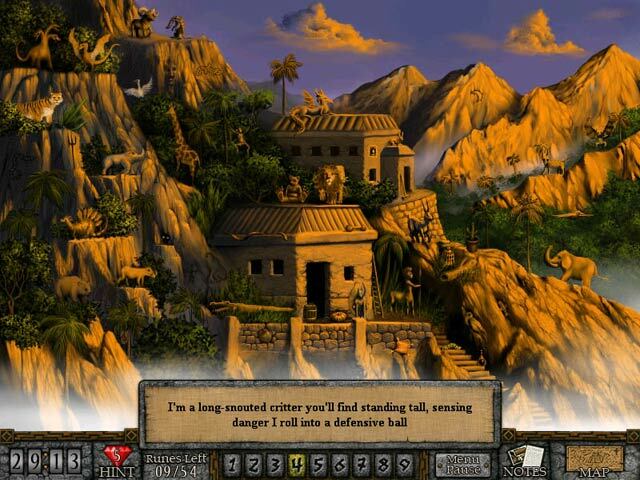 Rated 3 out of 5 by Boomer1097 from Searching Mayan Ruins I really wanted to love this game, but it fell short. You are an archeologist tasked with locating the missing journal of a Mayan Princess. The game consists of two activities: visiting various Mayan locations and solving riddles to locate items, after each group of locations is cleared, you create a picture by rotating the pieces until they are in the correct location. After you complete each level (locations and a puzzle), you are given another page of the journal. This is an older game so would not display full screen. For me, solving the riddles was easy, but finding the items ranged from simple to impossible (with most being difficult to find). Most of the scenes are difficult to see and some of the items are either tiny or almost invisible. You visit locations several times, so it becomes monotonous about half way through the game. You have 5 hints for each level, but you must use them sparingly. If you play as the Archeologist, each level is timed. You can elect to play the game without being timed. You are given a fairly generous amount of time and there is a pause button. If you are looking for a game that is HOS with an occasional picture puzzle...and you have excellent eyesight....you would probably enjoy this game. Rated 3 out of 5 by fairlind from Different, worth trying I'm reviewing the demo. The game relies primarily on riddles. It was refreshing in the beginning, but there wasn't enough variety of tasks to keep up my interest enough to buy the game. Strangely, I still recommend you at least try it, partly because of its original gameplay, and partly because it doesn't fall into the gothic-cutesy pit that most BF games do. Solve the riddles surrounding ancient artifacts to uncover what really happened to the last known royal Mayan family.